Small sector in plot 610, to the East of Le Rocher de la Reine. 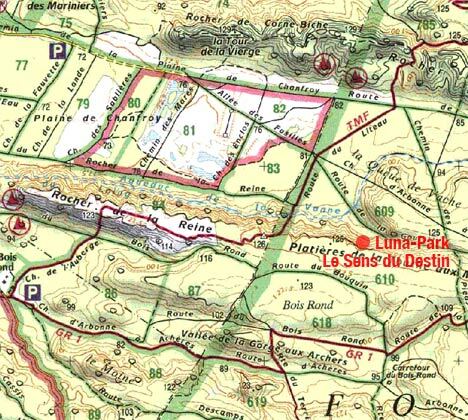 Access n°1 : use the parking lot along the D64, follow Le Chemin du Rocher de la Reine to its end (1700m), turn left at la Route du Linteau (TMF), then right at la Route de la Goulotte; the main boulder can been seen 200m on the right after the aquaduct. Access n°2 : La route du Linteau can also be reached from the parking lot of la plaine de Chanfroy by following the homonymous path and then l'Allée des Fusillés on the right.